Aluminum is a silver-white metal and is very light in weight (less than three times as dense as water) yet strong. Because aluminum is ductile, it can be drawn into wires or pressed into sheets or foil. Its light weight and resistance to corrosion make it ideal for use in aircraft, automobiles, beverage containers, and buildings. It is the most abundant metallic element, and the third most abundant of all elements in the Earth's crust, which makes up 8% of the crust by weight; only silicon and oxygen are more plentiful. 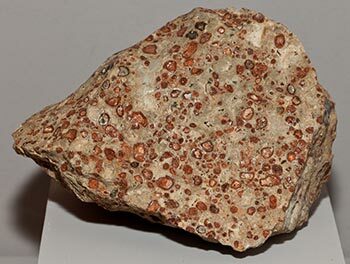 Bauxite is the name for a rock that contains a mixture of similar minerals that include hydrated aluminum oxides; these minerals are boehmite ( AlO(OH) ), diaspore ( AlO(OH) ), and gibbsite ( Al(OH)3 ). Bauxite is reddish brown, white, tan, and tan-yellow; is dull to earthy in luster; and can look like clay or soil. It forms through chemical weathering of such aluminum-rich rocks as granite. Bauxite is the main source of aluminum. Although bauxite is not mined in the United States, the United States is a major producer of aluminum, which is made mainly from imported bauxite and recycled aluminum. Other leading producers of aluminum are Canada, China, and Russia. Aluminum has numerous applications in the home and industry, and is a familiar metal to nearly everyone. Aluminum is a reactive metal, and does not occur in the metallic state in nature. Therefore, it was unknown as a separate element until the 1820's, although its existence was predicted by several scientists who had studied aluminum compounds. It was produced in metallic form independently by the Danish chemist and physicist, Hans Christian Oersted, and the German chemist, Frederich Wohler, in the mid-1820's. The name aluminum was derived from alumen, the Latin name for alum (an aluminum sulfate mineral). The metal was called aluminium with the -ium ending being the accepted ending for most elements at this time. This usage persists in most of the world except the United States, where the last i has been dropped from the name. Because aluminum metal reacts with water and air to form powdery oxides and hydroxides, aluminum metal is never found in nature. Many common minerals, including feldspars, contain aluminum, but extracting the metal from most minerals is very energy-intensive, and therefore expensive. The main ore of aluminum is bauxite, the source of over 99% of metallic aluminum. Bauxite is the name for a mixture of similar minerals that contain hydrated aluminum oxides. These minerals are gibbsite (Al(OH)3), diaspore (AlO(OH)), and boehmite (AlO(OH)). Because it is a mixture of minerals, bauxite itself is a rock, not a mineral. Bauxite is reddish-brown, white, tan, and tan-yellow. It is dull to earthy in luster and can look like clay or soil. Bauxite forms when silica in aluminum-bearing rocks (that is, rocks with a high content of the mineral feldspar) is washed away (leached). This weathering process occurs in tropical and subtropical weathering climates. Alternative sources of aluminum might someday include kaolin clay, oil shales, the mineral anorthosite, and even coal waste. However, as long as bauxite reserves remain plentiful and production costs are low, the technologies to process these alternative sources into alumina or metallic aluminum will likely not progress beyond the experimental stage. Most bauxite is first processed to make alumina, or aluminum oxide, a white granular material. Sometimes, raw bauxite is shipped overseas for processing to alumina, while in other cases it is processed near the mine. Alumina is lighter than bauxite because the water has been removed, and it flows readily in processing plants, unlike bauxite which has a sticky, muddy consistency. Australia, the United States, and China are the largest producers of alumina. All the U.S. alumina being made is from imported bauxite. Aluminum metal is refined from alumina, usually in industrialized countries having abundant supplies of cheap hydroelectric power. The refining process is the Hall-Heroult Process, named after Charles Hall of the U.S. and Paul L.T. Heroult of France, who each independently invented the process in 1866. In this process, alumina (aluminum oxide) is dissolved in molten cryolite (cryolite is an aluminum fluoride mineral, Na3AlF6). The alumina is then separated into its elements by electrolysis. Though attempts have been made to replace this process, it is to this day the only method used to isolate aluminum on a commercial scale. The largest producers of aluminum metal are Russia, China, the United States, and Canada, countries which have abundant hydroelectric power. More than 40 other countries also produce aluminum, including Norway, Iceland, Switzerland, Tajikistan, and New Zealand, which are small but mountainous, and have many rivers to provide hydroelectric power. Other areas of the world with access to abundant and cheap electricity, such as the Middle East, are also expanding their metal production capacities. Recycling of aluminum by melting cans and other products is an important source of metal in many developed countries. The lightness, strength, and corrosion resistance of aluminum are important considerations in its application. Metallic aluminum is used in transportation, packaging such as beverage cans, building construction, electrical applications, and other products. Aluminum, the third most abundant element at the Earth's surface, is apparently harmless to plant and animal life. Though aluminum is very important in industry and daily-life applications, it can be replaced by other commodities if necessary. For instance, copper can replace aluminum in electrical applications. Paper, plastics and glass make good packaging alternatives. Magnesium, titanium and steel can be used in vehicles and other forms of ground and air transportation. Unless energy costs should rise steeply, the use of aluminum in most of these applications is not likely to be seriously threatened. Worldwide sources of bauxite are large enough to supply the demand for aluminum for some time to come.